The Kindle Fire HDX is Amazon's premiere tablet. With its new, more powerful Android operating system, this latest version has some exciting bells and whistles along with the features that have made the Fire a tablet fan favorite: access to the amazing Amazon Appstore, online music storage, a large music and video store, a huge e-book library, and easy one-step ordering from Amazon. This full-color, For Dummies guide shows you how to take advantage of all the Kindle Fire’s functionality including browsing the web, sharing photos, watching videos, playing games, downloading apps, reading newspapers and magazines, and personalizing the device for your needs. 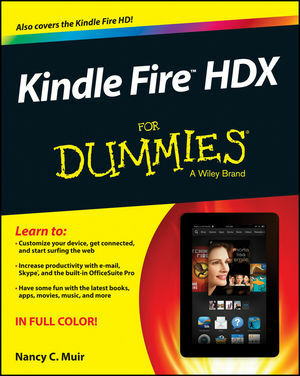 Blaze through Kindle Fire HDX For Dummies and start taking advantage of the hottest tablet in town today! Nancy C. Muir is a writer and consultant as well as the author of more than 100 books on business and technology topics. Her credits include multiple editions of Kindle Fire For Dummies, Computers For Seniors For Dummies, and Laptops For Seniors For Dummies.